Spring seems to be the time to try eggs with Celtic Knots. I'm a bit Irish, so I'm excited to try my hand at these. 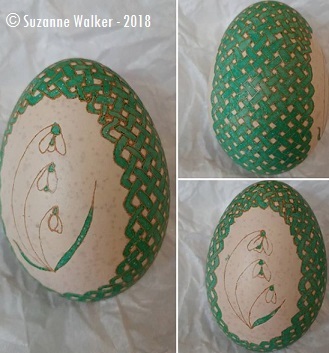 Celtic knots look complex and beautiful on an egg, and they are actually a bit difficult to get right. I have to concentrate very carefully in order to make sure all my lines are correct. I used this site to help teach me how to draw the knots that I've used on these two eggs and that I'm using on the 2nd ostrich egg that I've ever done. This is the first braided egg I ever tried. This egg was a brown egg before I etched it. I'll share more about etching in a later post.